Hours before a January 27, 2008 commemoration for the Holocaust and murdered Armenian-Turkish Hrant Dink, members of the Armenian community in Wales discovered the site for the event – a traditional Armenian khachkar (literally, cross-stone) opened in November of 2007 – had been vandalized by a hammar left at the scene. 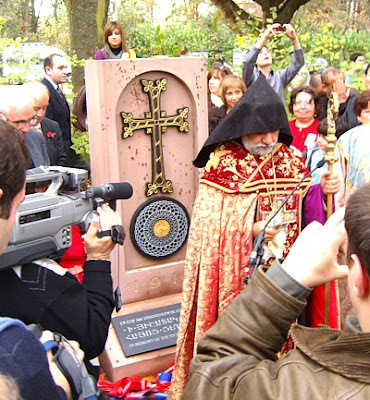 Image: A photograph from the November 3, 2007 opening ceremony of the Armenian Genocide commemorative memorial in Cardiff, Wales (United Kingdom) shows the khachkar (cross-stone) that was vandalized by a hammer in the morning of a scheduled event to commemorate the Holocaust and remember Turkish-Armenian journalist Hrant Dink. Photo courtesy ACCC. The tiny Welsh Armenian community were targeted with a despicable racist attack on Holocaust Memorial Day. The new Armenian Genocide Monument (which was erected by the community under the leadership of John Torosyan in November) was desecrated in the early hours of the morning before important ceremonies were held today to Commemorate the Holocaust, and to remember Hrant Dink. The ornate Armenian Cross on the monument was smashed to bits by persons unknown using a hammer, which was left at the scene of the crime. Eilian Williams, talking on the vandalism, has blamed the “Committee for the Protection of Turkish Rights” under the leadership of Hal Savas – a member of The Muslim Council of Britain – for the hate crime. Indeed, the announcement for the commemoration ceremony, posted at Seta’s Armenian Blog and apparently written before the news of the vandalism, expressed fears for violent Turkish protests quoting Hal Savas as saying, “[w]e will be out in force this time.” Savas’ group had protested the unveiling of the memorial in November of 2007, as reported by the BBC. It is not clear why the hammer – that was used to smash the cross on the genocide monument to pieces – was left at the scene. Perhaps a symbolic gesture to the December of 2005 destruction of the largest medieval Armenian cemetery in the world where Azerbaijani soldiers used sladghammers to reduce the sacred stones to dust? You should read BBC’s report on this, I have never seen a more craven and washed down news report in my life. 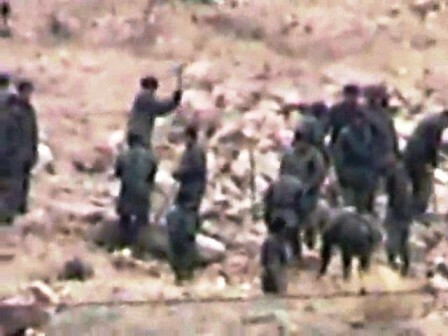 I swear, concerning the genocide, BBC reports right along those lines forwarded by Turkey. On another note, how many hits has Djulfa.com had? I think you should be careful when announcing names of people on your blog. I am the person referred to in your blog above and the matter was reported to Cardiff Police by myself and a statement delivered for their perusal and action. The fact the person named Eilian Williams is issuing statements libeling myself and our organisation and even mentioning the name of Muslim Council of Britain, thus inciting racial hatred maybe sufficient for matters to be taken to next stage for legal purposes. It is my wish that these statements are retracted or tangible proof is supplied to the Police Dept., in Cardiff to substantiate the claims. This is a sad case of two wrongs not making a right as I delivered a statement to Welsh media indicating my abhorrence on the criminal damage and that Police should also investigate possibility that this could be self inflicted wound to gain public sympathy. One can only pray that truth is not so far away.